The Cambridge Analytica scandal has reached 10 Downing Street. Campaigners have asked Downing Street what the prime minister and her cabinet colleagues knew before the referendum. May’s top aide is accused of outing a whistleblower as gay this weekend in a statement about the scandal. Vote Leave’s chief Dominic Cummings has issued a forceful rebuttal of the claims. LONDON – The Cambridge Analytica scandal, which is engulfing the official Brexit campaign, has now reached Theresa May’s door, with campaigners demanding the prime minister sack a senior aide who worked on the campaign. 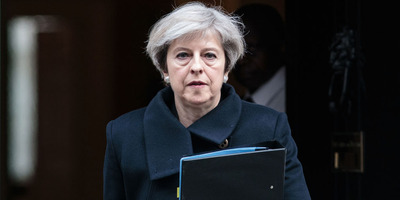 The prime minister is facing calls to sack her political secretary Stephen Parkinson – formerly a senior Vote Leave official – after he effectively outed a whistleblower at the centre of the scandal, Shahmir Sanni, as being gay. The whistleblower had alleged that the official Brexit campaign channeled funds into controversial data firm Cambridge Analytica through another campaign – which cold potentially be a breach of electoral law. Parkinson’s statement, which implied that Sanni’s former relationship with Parkinson may have been a motivating factor in his allegations, was published by former Vote Leave chief Dominic Cummings and reportedly also sent out by Downing Street staff to the press. Sanni’s lawyer released a statement in response which said he had been forced to come out to his family and said his relatives in Pakistan, where homosexuality is illegal, had been “forced to take urgent protective measures to ensure their safety. Sanni had alleged to the Observer newspaper that a £625,000 donation from Vote Leave to a Brexit campaign group called BeLeave had been funneled to AggregateIQ, a digital services firm with links to Cambridge Analytica. He also alleges that the £625,000 donation to another supposedly independent Brexit campaign was in breach of electoral rules because Vote Leave shared offices with BeLeave and exerted influence over the smaller organisation. The scandal has also put pressure on Boris Johnson and Michael Gove, the foreign and environment secretaries, who fronted the Vote Leave campaign. Both have dismissed the claims as politically motivated. What did Michael Gove and Boris Johnson know about the co-ordination of the Leave campaign and AggregateIQ? Is the prime minister planning to investigate what they knew about the claims? Does May plan to investigate the staff mentioned in the reports who work for 10 Downing Street? Did 10 Downing Street directly out Sanni, or have any involvement in his outing? Vote Leave’s chief Dominic Cummings issued a forceful rebuttal of the claims on Friday, describing the Observer’s allegations as “factually wrong, hopelessly confused, or nonsensical” in a blog post.